We love a good bag here at TechCrunch. Heck, it’s a dirty little secret that Bag Week can happen several times in a given year, if we’re so inclined. Generally I prefer a bit of minimalism in my bags, though I’ve been known to go in for something a bit more complex, if it strikes my fancy. I fell in love with this Timbuk2 travel backpack on a recent trip to Asia. By any standards, however, the Agazzi backpack is…a lot. It’s like the Samsung of backpacks. It’s big, brash, pricey. It’s looks pretty cool and has a lot of features — some of which appear to be included solely for the sake of inclusion. But if you’re going to buy a $246 bag from Kickstarter, you’re going to want the bells and whistle. And that, mind you is the early bird price. The company says the “Pro” version will run $460 at retail. I balked a bit at the Timbuk2’s $200 price tag, mind. That price gets you external lighting for bike rides, internal lighting for finding your stuff, an on-board charger, an RFID pocket for your wallet and, most compellingly/bizarrely, a fingerprint reader. Agazzi’s revolutionary anti-theft fingerprint lock keeps your belongings safe at all times. 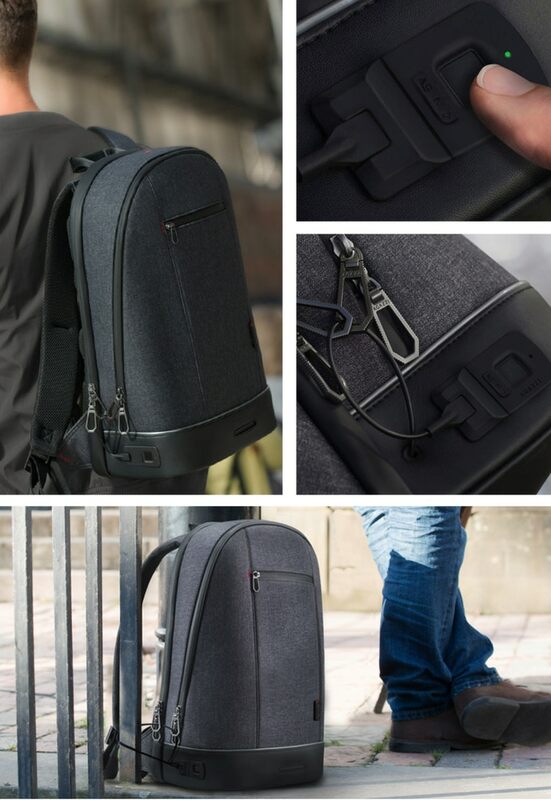 A strong stainless steel retractable cable enables you to lock your backpack compartments (no more worries about theft) as well as allows you to secure the backpack to a fixed object, providing peace of mind in crowded places. Granted, it’s probably still easier to get into a backpack that to spoof a phone, but I can see the value in being able to tether the thing to, say, a rail, so I don’t have to take my backpack with me every time I go to the bathroom. The Verge played with a preproduction version and says it works reasonably well. Anyway, the project’s on Kickstarter today. Deliveries are expected in September.